Severus says that it had better be a good one (or it's detention for you, young lady)! Wow, Lark!!!! You actually made this? Wow! For my limited technical skills, even creating such pic is too much (finding something on the net and adding the writing to look like a reak cake! Too much! 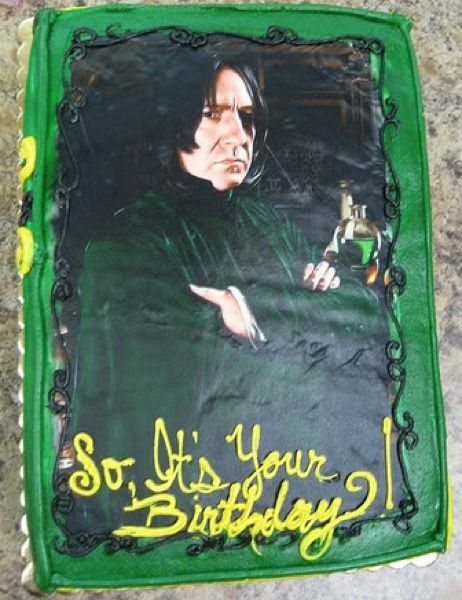 ), but I believe you even made that a *Real* cake. I can't even. Happy Birthday from me too, Verdeckt! Oh, tt, you have enough talent to do this, no question! But, no, I didn't make this. It was done at a local bakery, where they have a printer that prints with edible inks on rice paper, so anyone could do it if they had the proper equipment. Awesome cake! Somehow green-ish robes remind me of Minerva. I'm sure he picked up the wrong ones in the morning, that's why he's so grumpy. LOL! That picture is true to the colors that they printed, so maybe you are right! Oh my dear, I do not deserve you. Thank you for the kind birthday wishes (what a FABULOUS cake)!